It’s been some journey for Liverpool this season in Europe. From beating Hoffinheim in the play offs, coming through a tough group including Sevilla, easing past Porto in the last 16, demolishing Manchester City at the Quarter Final stage, just overcoming Roma in the Semi Finals to now facing Real Madrid in the Final, it has been Jurgen Klopp’s heavy metal football at its best. Not to mention, they are also the highest scoring team in the competition. Liverpool are no strangers to the Champions League final. They are a football club that has long been steeped in great European tradition, with the club winning the elite trophy in Europe 5 times. This Saturday night, they look to add number 6 to the trophy cabinet but the mighty Real Madrid stand in their way. Ronaldo and Co are looking to win the competition for the 13th time and for the 3rd year in a row. But there is every chance that this Liverpool team with their lightening fast attack, mobile midfield and ever improving defence, can triumph in Kiev against Madrid. Saturday night’s final will be the last time that Liverpool will wear the 2017/18 jersey. From the start of next season, ‘The Reds’ will be wearing their brand new retro New Balance home jersey. Liverpool have reintroduced a collar to the home shirt, a tipped two-button polo collar that gives the 2018/19 shirt a lifestyle look, making it even more wearable for fans. It also includes the New Balance dry, moisture wicking material which keeps you cool and dry. 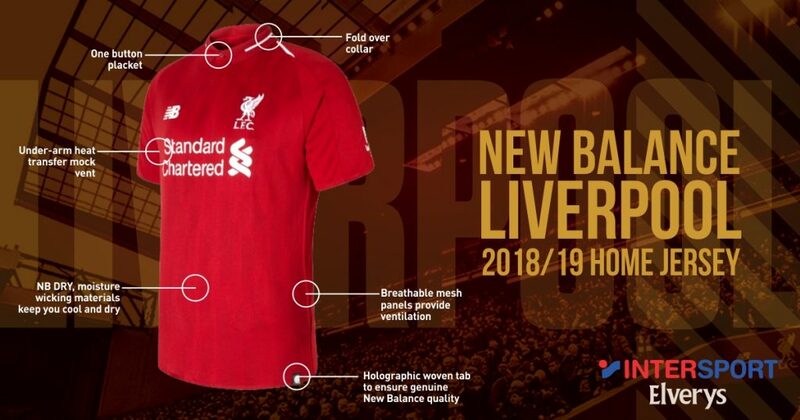 The new home jersey also has the Eternal Flame 96 embroidered on the nape which was designed as a special tribute to the 96 fans that passed away in the Hillsborough disaster in 1989. Gear up for the final with the new 18/19 jersey, available in-store and online at elverys.ie.